Last week we had that miracle of miracles: a hot, sunny, spring week in Amsterdam. Of course, now it’s 12 degrees and raining again, but that’s why you have to make the most of these things while they last. And while tonight I might be making a late-winter stew, last week had me craving salad for the first time in months. Which is why when a blogger friend invited me to the new branch of Venkel on the Javastraat at the last minute, I said yes straight away. Work could wait. 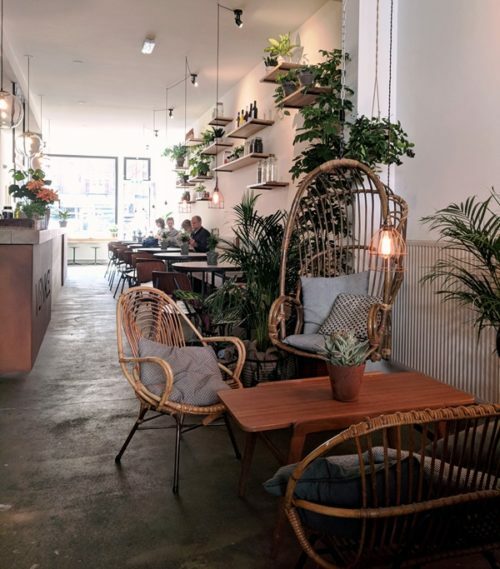 Shamefully, I have to admit I’ve never been to the original Venkel in de Pijp, but I’ve heard the new one’s bigger – and it certainly looked the part with hanging baskets of greenery, mossy wall art and cosy lounge corners. 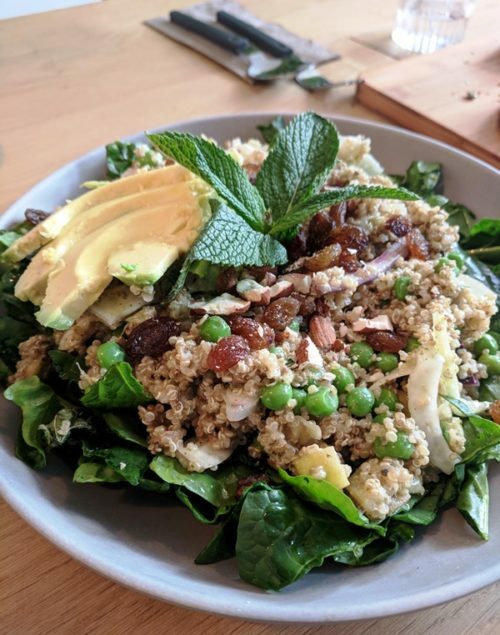 The menu is much what Venkel fans would expect – plenty of salads, hummus and gluten-free bread – but the new branch is open for longer and has a horeca licence. So you can expect smoothie bowls at breakfast time and a range of (alcoholic) drinks and borrelhapjes for the evening. 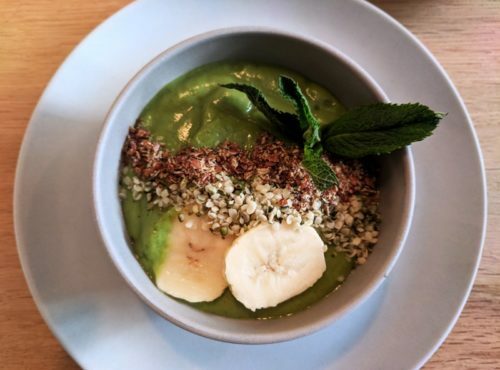 We tried what felt like almost everything on the menu: my green smoothie bowl was a healthy hit of spinach, avocado and banana, topped with various seeds. If I was paying, realistically I would never order a smoothie bowl (if I’m going out for breakfast, I’m ordering eggs Benedict or something that says “weekend” more than “detox”) but fans of these popular bowls will no doubt be thrilled. The hummus in itself was nothing remarkable, but the homemade bread it came with – a fibrous concoction of quinoa, flax seeds, oatmeal, chia seeds, raisins and pumpkin seeds – was surprisingly good and not too much like sweet cake (which is what it looked like). Meanwhile, we shared five of Venkel’s salads, which were of course the real reason for my trip out east. Probably my favourite was the “Mangomania”, involving mango (obviously), chicken, chickpeas, cauliflower, peanuts and a curry dressing that was exotically fragrant from kaffir lime. Also good was the “Bloemetjes & Preitjes” salad, named after its cauliflower and leek, as well as lentils, pickles, raisons, cashew nuts and a creamy yoghurt dressing. The only salad I wasn’t a fan of was “Vol Lof”, whose constituent parts of kidney beans, apple, figs, walnut and crispy bacon just tasted like the sum of its ingredients rather than hanging together in a cohesive whole. We barely had room to taste the borrelhapjes that were put down in front of us last, so I happily left aside the dreaded stuffed mushrooms (my issue, not Venkel’s). 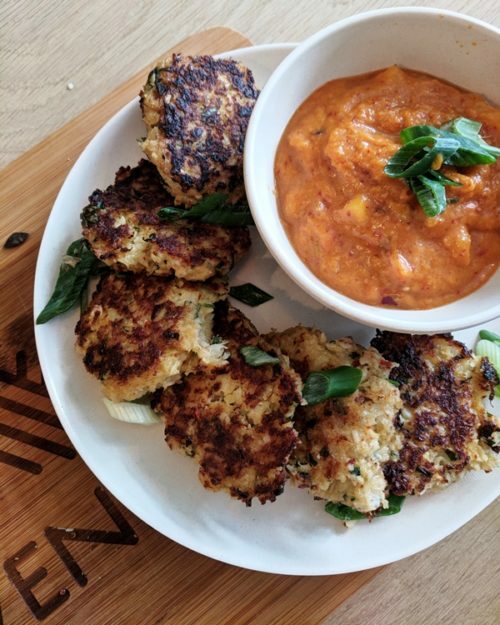 Asian fishcakes were fibrous and flavoursome from coconut, and came with a spicy, tangy mango salsa. And finally, crackers with vegan dips did a very passable impression of an egg-based aioli. Want more foodie recommendations beyond salads and smoothie bowls? 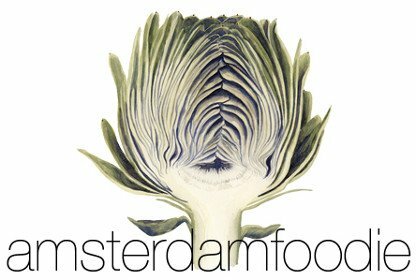 Download my Amsterdam Restaurant Guide!